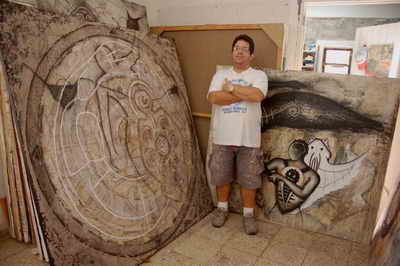 Daniel Zafra - The world's best Cuban painter! "An animal can become plant, a plant in the animal. A man can become plant, animal or vice versa." "In my work, I reflect upon the invention of myth as a result of the accumulation of historical recovery, which reaches my conscience in various ways." "Building on the legacy of our ancestors, rock art has expressed the need for the abstracted, the idealized as a reflection of primitive culture in general. This result, the whole iconography in my work is part of a careful selection to create and recreate symbols and signs, which suggest a speculative metaphorical language, which hyperbolizes the narrow and delicate spiritual thread, sometimes providing magnificence and other times spoiled, differentiated traits." Zafra lives near Santiago de Cuba with wife and son. He is a member of La Unión de Escritores y Artistas de Cuba (UNEAC). His paintings are in private collections in Germany, France, Portugal, Spain, Italy, Canada, Costa Rica and the United States. ©Copyright Daniel Zafra 2020. Greatest Cuban Painter ever!